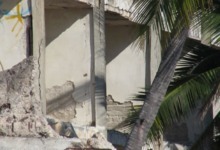 Contrary to popular belief , the sort of political intrigue, violence and corruption which accompanied the building and subsequent destruction the hotel Behia de Tenicatita in is not at all limited to Mexico. It can probably be argued that every city, in every country, is born out of human conflict? Certainly, there can be little room for doubt that, whether it is by human hand or by the forces of nature, every city will one day share a similar fate to this once grandiose hotel in Mexico. The camera-work, like the hotel building, is unstable and fragmented. Take–by-take we witness time passing as the camera pans and tilts erratically amongst the ruins. 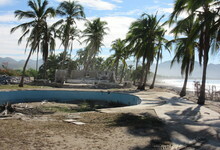 The concrete ruins look very static, when seen from the adjacent beach, but close up, the camera creates an altogether different sense of time passing. In the late afternoon light, shadows are seen to creep rapidly across the fractured ground, where scorpions and geckos scurry amongst the debris.. The camera viewpoint shifts constantly as if looking for something important. Texture and detailed emerge from the swirling pastel hues of light and shade. Sometimes, architectural detail materialise on the surface of the screen, at other times the bright uncompromising colours of graffiti appear out of the chaos as if to defy the passage of time. Using some rapid camerawork and crash editing the hard edges and assertive colours of gang tags along with less formalized declarations of love and death are folded into the same passing stream of dancing pixels and the rapidly changing flow of images. In Momentum the fallibility of human aspiration and the comparatively certainty of concrete, are both seen to be parts of a constantly changing river of colour and light. The monumental solidity of the massive concrete ruins are thus seen to be as unstable and as tenuous as both the lives of those who built them or those who have since inscribed their identity on the crumbling walls. Although we may find consolation in the idea that the world around us is predominantly stable with only an occasional disruption to the fabric of our personal realities, it is probably more realistic to understand, as Heraclitus did more than a thousand years ago, that pockets of stability are in fact, unusual and temporary and that the only constant is continuous change.